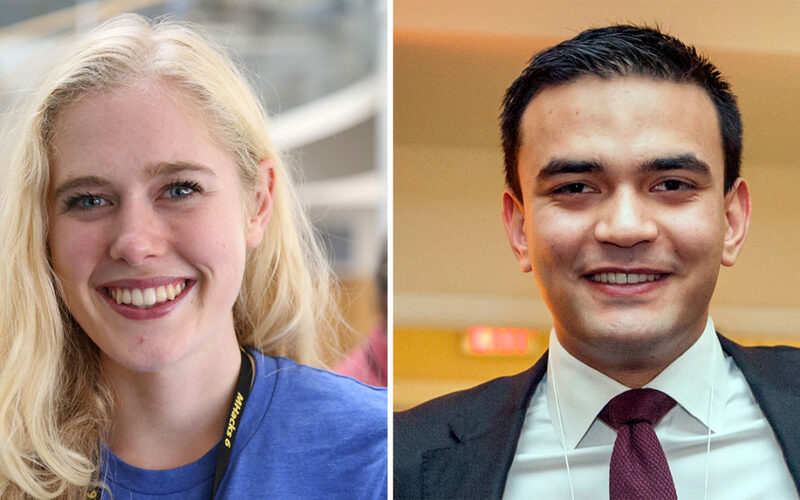 The Loran community would like to congratulate Clare Lyle (Belzberg Loran Scholar ’14) and Iain Sander (Loran Scholar ’13), the 20th and 21st Loran Scholars to earn Rhodes scholarships over the past 24 years. Clare is studying Mathematics and Computer Science at McGill University. From Gibsons, BC, Clare is the web editor for the McGill Tribune, Director of HackMcGill and the computer science undergraduate society representative for students. She is also a mentor for Ladies Learning Code, leading workshops to teach women how to code. As co-chair of the World University Service Canada she worked to increase funding for the student refugee program. Clare spent a summer as a project manager and software programmer at Microsoft in Redmond, WA, and has worked at the Future of Humanity Institute at the University of Oxford, where she examined the policy implications of artificial intelligence. Originally from Lethbridge, AB, Iain studied Chemical Engineering at Queen’s University and is currently a medical school student at the University of Alberta. Iain spent his community development summer in France as a live-in assistant with L’Arche, an organization for people with intellectual disabilities. He also worked for FarmingSmarter, an association of agricultural producers in southern Alberta, and Estevan Capital, a privately held investment company in Toronto. On campus, he was the project manager for a first-year engineering student program, a peer tutor and the coach for a swim team of athletes with disabilities.